Q: We noted that a dialogue session on the Belt and Road Initiative was held during the World Economic Forum Annual Meeting which is now underway in Davos. Many world leaders and officials, including the President of Azerbaijan, the President of Botswana and the Finance Minister of Singapore, spoke highly of the Belt and Road Initiative. 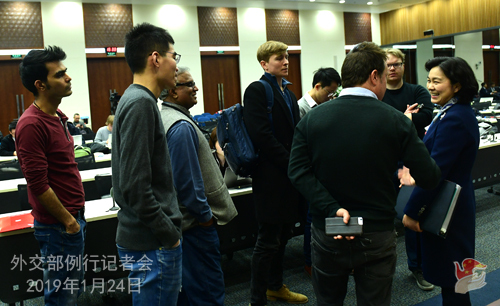 Experts at the session also agreed in general that the key word for the dialogue session is "mutual benefit", and China has offered some real help to those countries that have no resources or lack building capacity. What is your comment? A: Indeed, "mutual benefit" is one of the salient features of the Belt and Road Initiative. The Belt and Road Initiative is enjoying so much popularity and support because we are committed to following the principle of extensive consultation, joint contribution and shared benefits, upholding openness, transparency and inclusiveness, pursuing high quality, and valuing rules-abiding. In May 2017, as you may remember, the first Belt and Road Forum for International Cooperation was held successfully in Beijing which drew guests from more than 140 countries and over 80 international organizations and had very extensive and positive international influence. The Belt and Road Initiative has become the most popular international public good. 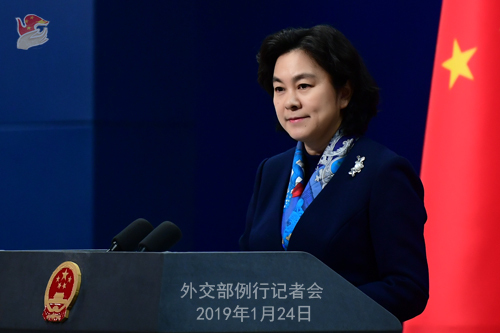 I know that on January 22, the Spokesperson for the National Development and Reform Commission made a detailed briefing on the implementation of the outcomes of the first Belt and Road Forum for International Cooperation. By the end of 2018, 269 of the 279 outcomes of the first BRF, or 96.4% of the total, have been realized or turned into routine work. The remaining 10 outcomes are being implemented. Facts have proven that the Belt and Road Initiative has brought tangible benefits to the people of all countries along the way. I believe that as the Belt and Road Initiative takes steady steps forward, it will make greater contributions to the cause of global cooperation and common development. 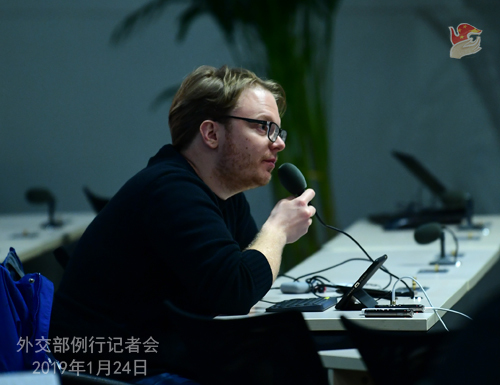 Q: During an interview in Davos, Michael Moller, the Director-General of the United Nations Office at Geneva, said that China plays a vital role in supporting multilateralism in an increasingly diverging world. He recalled the Chinese leader's remarks on the country's firm commitment to multilateralism two years ago in the Palace of Nations, Geneva. He added that in the following two years, China demonstrated its commitment with concrete actions. What is your comment? A: I have noted relevant reports, and we appreciate Director-General Moller's positive remarks. China is committed to supporting, upholding and practicing multilateralism. President Xi Jinping's keynote speech at the opening ceremony of the World Economic Forum Annual Meeting at the beginning of 2017 left a deep impression on all of us. In his speech, President Xi Jinping put forth China's proposals on promoting world economic growth and advancing globalization, which was warmly received and echoed by the international community. This year, Vice President Wang Qishan attended the WEF annual meeting in Davos and further elaborated on China's observations and proposals. He pointed out that with more inward-looking policies and spreading unilateralism, protectionism and populism, the multilateral order is faced with severe challenges. Economic globalization is at a juncture where it can only go backward if not forward. Facing these headwinds, China chooses to give full play to its own role. We have been unswervingly promoting all-round opening up, advancing international cooperation on the Belt and Road Initiative and building an open world economy at a higher level. 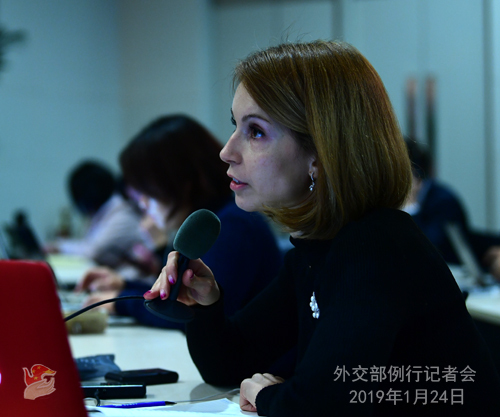 Guided by the principle of consultation and cooperation for shared benefits, China is committed to fostering a new type of international relations featuring mutual respect, fairness, justice and win-win cooperation. Vice President Wang also underscored that we should uphold multilateralism, engage in extensive dialogue and cooperation based on mutual respect and mutual trust, and jointly build a system of rules for technology and a new framework for international cooperation featuring peace, security, democracy, transparency, inclusiveness and win-win outcomes, so that the benefits of technological innovation can be shared by all mankind. In the face of a growing number of uncertainties and instabilities worldwide, members of the international community have ever more needs and common interests in upholding multilateralism. We will work with the international community to adhere to a global governance vision featuring consultation and cooperation for shared benefits, firmly support rules-based multilateralism, build an open world economy and foster a community with a shared future for mankind. Q: The Australian side says that China failed to fulfill its obligation under the China-Australia consular agreement because China did not conduct consular notification to the Australian side about the detention of Yang Jun in a timely manner. What is your comment? A: After checking with the relevant department, Yang Jun, an Australian national, has been taken compulsory measures and is being investigated by Beijing State Security Bureau in accordance with the law on suspicion of engaging in criminal activities that endanger China's national security. This case is still under investigation. All the legal rights of Yang Jun have been fully guaranteed. After taking compulsory measures against Yang Jun, the Chinese side has made official notification to the Australian Embassy in China. Q: According to reports, on January 23, President of Venezuela's National Assembly Juan Guaido was sworn in as the country's "interim president". The US, Brazil and other countries have issued statements to recognize that. Venezuela's Supreme Court reaffirmed that the relevant action of the National Assembly "has violated the Constitution". President Maduro announced his decision to sever diplomatic ties with the United States. What is your comment? A: We have been closely following the current situation in Venezuela and call upon all relevant parties to stay rational and cool-headed and seek a political solution to the issue of Venezuela through peaceful dialogue within the framework of the Venezuelan Constitution. China supports the efforts made by the Venezuelan government to uphold national sovereignty, independence and stability. 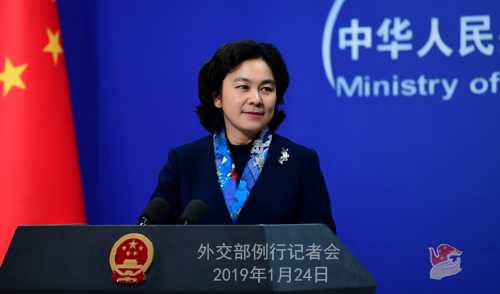 China always upholds the principle of non-interference in other counties' internal affairs and opposes foreign interference in Venezuela's affairs. We hope that the international community can jointly create favorable conditions for that. Q: The Australian Foreign Minister said that while the Chinese side has informed Australia of the detention of Yang Jun, the Australian side is yet to receive any explanation for the reason for his detention as is required under the consular agreement. Is that the case? When might they get a reason? A: When taking the question raised by the journalist from Bloomberg, I said that after taking compulsory measures against Yang Jun, the Chinese side has made official notification to the Australian Embassy in China. Yang Jun has been taken compulsory measures and is being investigated by Beijing State Security Bureau in accordance with the law on suspicion of engaging in criminal activities that endanger China's national security. Q: Reports say that French Foreign Minister Jean-Yves Le Drian expressed hope for the early establishment of the Special Purpose Vehicle (SPV) aimed at facilitating non-dollar business with Iran and circumventing US sanctions to help Iran benefit from its oil resources and purchase necessary products from its three European partners. What is China's comment? A: I have also taken note of relevant reports. As we all know, the unilateral sanctions the US imposed on Iran outside the framework of the UN Security Council are not in line with international law and have met with universal opposition of the international community. At present, the international community including France and the EU has consensus and common interests in upholding and implementing the JCPOA. We appreciate the efforts made by the European side to maintain normal economic and trade cooperation with Iran and safeguard the JCPOA. China supports the early establishment of this mechanism. Q: US President Donald Trump in a statement said that the US recognizes the leader of the Venezuelan opposition Juan Guaido as the interim president. He added that the US does not rule out the military option. I wonder if China has any comment on that? A: President Maduro started his new presidential term from this January 10. Many countries including China as well as international organizations had sent representatives to attend his inauguration ceremony. 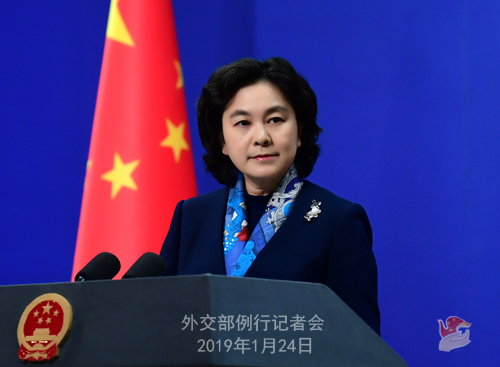 China hopes that all relevant parties in Venezuela can bear in mind the fundamental interests of their country and people, resolve political differences through dialogue and consultation on the premise of respecting constitutionalism, avoid violent conflicts and restore normal order. As important countries in the Western Hemisphere, the US and Venezuela have close traditional relations. We hope that the two countries can handle their relations on the basis of treating each other as equals, mutual respect and non-interference in each other's internal affairs as this not only serves the interests of the two countries and two peoples but also can contribute to peace and stability of the Americas. We have noted that all relevant parties are firmly opposed to military interference in Venezuela. I want to stress that external sanctions and interference will only complicate the situation and cannot help resolve the current issue. Venezuela maintaining stability and development serves the interests of all relevant parties. We hope that all relevant parties can contribute more to Venezuela's stability. Q: Russian Foreign Minister said yesterday that Russian Deputy Foreign Minister Sergei Ryabkov and US Under Secretary Andrea Thompson are planning to attend the meeting of five nuclear-weapon countries, which will be held in Beijing next week. Could you confirm this and give us more details? A: I can confirm that there indeed will be such a meeting. As the rotating coordinator of the five nuclear-weapon states mechanism, China will host a formal meeting of the five nuclear-weapon states on January 30th in Beijing. The theme will be strengthening coordination of the five nuclear-weapon states and safeguarding the NPT mechanism. The five countries will have an in-depth exchange of views on nuclear policies and strategies. Issues like nuclear disarmament, nuclear non-proliferation and peaceful uses of nuclear energy will be discussed. China, the US, Russia, the UK and France are the nuclear-weapon states designated by the Treaty on the Non-proliferation of Nuclear Weapons (NPT). The coordinating mechanism of the five nuclear-weapon states gradually took shape during the review process of the NPT. This meeting will be the first formal one in two years for the five states. Recently, all sides have maintained close communication to actively prepare for it. Against the backdrop of increasing instabilities and uncertainties in the current international security landscape, there is greater attention on major country relations and responsibilities for major countries. We believe that it is of great significance for the five nuclear-weapon states to enhance coordination and cooperation, properly manage differences and jointly uphold international peace, security and stability. Q: Canada's Ambassador to China John McCallum said Meng Wanhzou has strong arguments to fight extradition to the United States. He also said her extradition to the US would not be a happy outcome. What is your comment? A: China has stated its solemn position on the Meng Wanzhou case many times. We have pointed out explicitly that this case, from the very beginning, is not an ordinary judicial case. We have noted the relevant remarks by Ambassador McCallum. We believe that anyone with normal judgment could see through the nature of this case. We hope that the Canadian side will make the right choice instead of risking endangering itself for other's gains. Q: A Japanese magazine called Nikkei Asian Review has reported that the Chinese leader might travel to India as early as in February or maybe after the two sessions in March. Can you confirm this? A: Did you say that Japanese media reported that the Chinese leader will visit India? I have not heard of it. China and India are important neighbors to each other. China-India relations enjoy a sound momentum for growth and our leaders maintain good communication and exchanges. Q: The Australian Defense Minister who is visiting China at the moment said today he was disappointed that China had not yet granted consular access to the Australian side as is required under the bilateral consular agreement. Is there a reason why they have not yet been given access and when might that access be granted? A: With regard to the Australian Defense Minister's visit to China, I would refer you to the Defense Ministry. As to the case of Yang Jun, like I said just now, after taking compulsory measures against Yang Jun, the Chinese side has made official notification to the Australian Embassy in China. China and Australia have unimpeded channel for consular communication. China has provided necessary assistance for the Australian side to fulfill consular duties. Q: Recently there was media report that a China-Philippines professional service personnel cooperation center was set up in Guangzhou. The two countries have signed an MOU on lifting restrictions on Filipino workers to China and China is ready to receive 300,000 Filipino workers. Can you confirm this and what is your comment? A: According to my information, China and the Philippines signed an MOU on Filipino English teachers working in China in April 2018. The implementation of this document has already started. Besides, the two sides have not made any arrangement on other areas of labor cooperation. So the report you mentioned is not true. Q: Does China still recognize Nicholas Maduro as the current President of Venezuela? A: Like I said just now, many countries including China as well as international organizations had sent representatives to attend the inauguration ceremony of President Maduro on this January 10. China supports the efforts made by the Venezuelan government to uphold national sovereignty, independence and stability. Q: You are well aware of the worldwide concerns about the trade war between China and the US. We are also aware of the efforts made by the two countries to resolve the differences. Now the Huawei issue came in between. There are wide-spread concerns about the impact it is going to have on the final trade talks that are going to be held on January 30th and 31st between the two countries. What is your view on this? Will China insist on the resolution of this issue before the trade talks? A: First, I'd like to thank you for your attention on the ongoing trade talks between China and the US. It reflects the attention from the international community on this issue. I believe all countries hope these talks can yield positive outcomes, as it is good for China, the US and the world beyond. As far as I know, the working teams from the two sides are following the important consensus reached by the two heads of state to maintain close communication. The Ministry of Commerce has released the information that Vice Premier Liu He will travel to the US for trade talks. On the illegal detention of Huawei's senior executive by Canada at the behest of the US, China has made clear its solemn position many times. It is not an ordinary judicial case but a serious mistake from the very beginning. As I pointed out yesterday, the extradition request the US raised to Canada is essentially related to its unilateral sanctions on Iran. It does not comply with the international law and is not legitimate. I hope Canada and the US can recognize the seriousness of the issue and take measures to correct their mistakes as soon as possible. Q: When you said that we hope the Canadian side will refrain from risking its own interests to serve those of others, do you mean extraditing Meng Wanzhou to the US? A: It is very easy to understand. Canada and the US have abused their bilateral extradition treaty and seriously violated the safety and legitimate and legal rights and interests of the Chinese citizen. We have made our stern position clear. The current state of China-Canada relations did cause a huge impact on bilateral exchanges and cooperation, something we don't want to see and something not of our making. In order to change the current situation, the Canadian side needs to face up to the issue squarely, take China's solemn concerns seriously, and take measures to correct its mistakes. Q: I know this is not a diplomatic question, but other ministries won't respond to it. Whether Microsoft Bing search engine has been blocked in China? A: You know this is not a diplomatic question and yet you still want to try your luck on me? I am afraid you have to ask the competent department because I don't have any information on that.